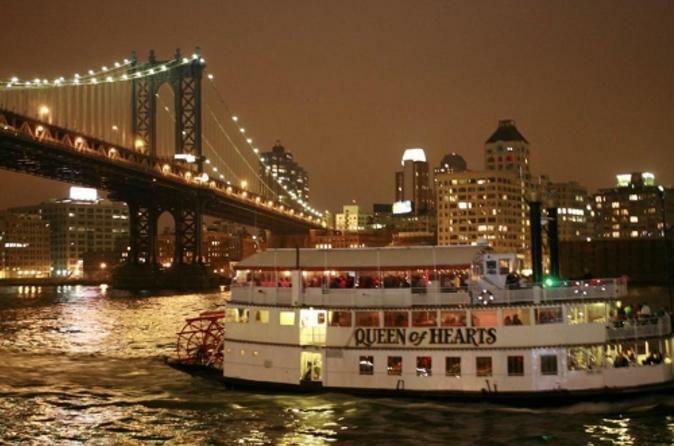 This Fourth of July cruise in New York City gets you great views of the city's fireworks display. During the 5-hour excursion, glide past famous landmarks such as Ellis Island and the Statue of Liberty while you jam to tunes played by an on-board DJ. Upgrade your experience with a buffet dinner or a premium open bar. Round-trip transfer from the airport is available if option is selected at booking. Meet your ship at Pier 36 in New York City. Step on board and watch the city skyline glide by as you leave the harbor. You'll sail by important New York City landmarks such as Ellis Island and the Statue of Liberty. Jam to tunes spun by the on-board DJ as darkness falls and you get a good spot to watch the fireworks show. Macy's has been putting on New York's fireworks show since 1958, and you'll have front row seats to the approximately 50,000 pounds of fireworks set off from platforms along the Brooklyn Bridge. Upgrade your experience with an optional premium open bar package or a 5-course dinner. See Itinerary section below for a sample menu. Return to Pier 36 after your 5-hour cruise.